I just found a challenge over at "The Cuttlebug Spot" - Embossing something other then paper :-) . I made a wedding card for the challenge. I embossed this sweet, little acetate butterfly. 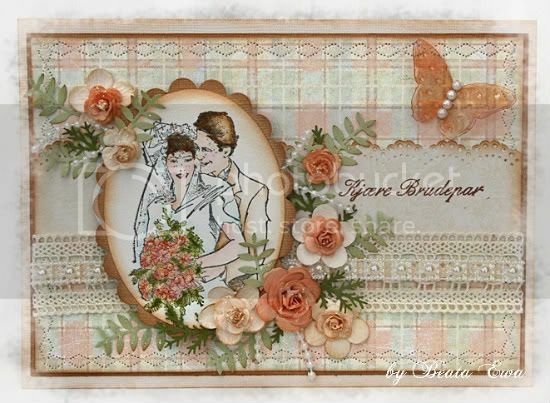 The beautiful couple I used here is from North Star Stamps, along with the text. Å, dette var simpelthen vakkert! Nydelig motiv, flotte papirer og lekre farger og detaljer! Wowwww Beata,what beautiful card,l love the image and colour. This is just gorgeous!!!! I absolutely adore that butterfly!!! Thanks for joining us this week at The Cuttlebug Spot! WOW!!!!! Dette var veldig, veldig fint Beata! Alltid så masse fint i bloggen din!!!! Beata this card is stunning! You did an amazing job! Beautiful card! Love the embossed butterfly.